What do seeds need for germination? Seeds are pretty simple, and can be low maintenance. They really only need three things: moisture, warmth, and air. Seeds have a little taproot inside of them, and when the seed "pops", the taproot extends out of the shell in search of moisture. When you provide the seed plenty of moisture, the taproot swells up, cracks the shell, and shoots out, extending into the grow medium. The seed will not germinate until the conditions are perfect, so make sure you give your seeds everything they need to germinate! 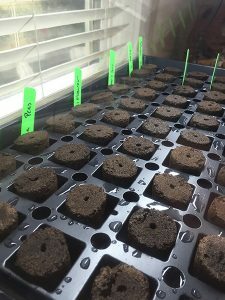 What are the best way to start seeds indoors? Mark your strains and stay organized. There are any number of ways you can start your seeds inside. 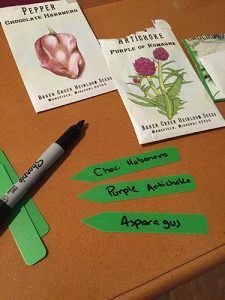 We are going to give you three ways to start them, ranging from the simple paper towel method, to planting right in your grow medium, or using a premium seed starting kit. We will start with the most simple and budget friendly option. This is one of the most common methods of germinating seeds, especially among hobby growers. In this method, you will need an absorbent kitchen paper towel. Since paper towels are so absorbent, they will hold moisture very well for your seedlings. Soak your paper towel, and allow excess water to run off. You don't want to drown your seeds. Then, place your seeds inside, and fold the paper towel over them in half, creating a "blanket" almost. You can then place them in a windowsill or under natural light. If you notice the paper towel starts to dry out, just reapply water. With any method of seed starting, keep your seeds warm. This is one of the three critical aspects of germination. You can use a seedling heat mat to accomplish this if you have no other way at home. How long does it take seeds to germinate in a paper towel? Be patient and try not to disturb your seeds while they germinate. This process can take up to 5-7 days depending on the genetics of your seed. Remember that this is not the best way to start seeds. You will have to handle the delicate seedling once the taproot sprouts, which can damage it. You should also be prepared for some of your seeds to never germinate. If you really can't shell out for some pots or a seed starting kit, you can get by with this method. But we don't recommend it for serious growers. A better way to germinate your seeds is by putting them right into a soil or other grow medium from the start. This will prevent you from having to transplant them once you see the taproot pop, saving you time and the possibility of damaging the fragile taproot. Prepare your garden pots in advance. You should use small garden pots, like these. Just like with the paper towel method, soak your soil, coco, or grow media in water beforehand. To supercharge germination, mix in some rooting compound with the water to provide the seedling with compounds to encourage rapid rooting. Once you have your medium pre-soaked, put some holes 5-10mm deep in preparation for your seeds. This height allows them to be close to your seedling light, and encourage them to grow towards it. Then, carefully place your seed inside and cover it up. Special Price $10.86 on sale until 4/30/2019! How long does it take seeds to germinate in soil? You should see signs of germination within two weeks. This method may take a little longer than using paper towels, but there are benefits here. This method causes minimal stress to the seeds, and the rootlet can start developing as soon as it emerges, unlike the paper towel method. If you are afraid of damaging your sprouted seeds, just avoid the paper towel method altogether and opt for this method or using starter plugs, which we will discuss next. If you are serious about your grow, and don't want to spend time messing around with lower success rates, jump straight into using a complete seedling kit and starter plugs. This method of germination offers you the highest success rate, with the least amount of work on your end. Just like any other method, pre-soak your starter plugs with water and rooting solution. 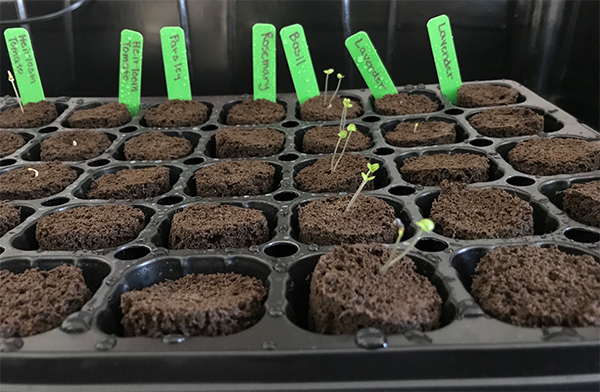 These make germination a breeze, because you can pop your seeds into them once they are soaked, put them in your tray, cover it with your dome, turn on your equipment and let them grow! Another reason for using rooting plugs is that once the seedling becomes a baby plant, you can transplant the plug and the plant directly into the new medium. This will prevent you from disturbing the delicate new roots. An alternative to starter plugs are rockwool cubes, which work just as well. You can find all our seed starting kits here. 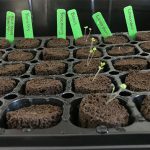 How long do seeds take to germinate in a seed starting kit? These kits set up the perfect conditions for germination, so it is no surprise that you will shave a few days off the process with this method. another advantage, which was already listed, is the starter plugs can be transplanted right into a new grow media when the time comes. If you are serious about your grow, or just want to make things easier on yourself, use a complete seed starting kit. 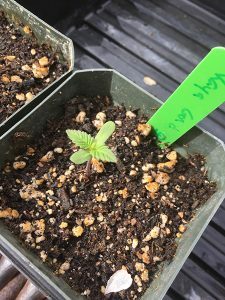 This can be a frustrating time period for growers, and a common reason many opt to start with clones. Being patient is important, but there are some ways to decrease your waiting time. Providing your seeds with a high-quality seedling grow light will encourage them to root faster. They will absorb the lights energy, and in hopes up reaching more of it, start growing towards the light. 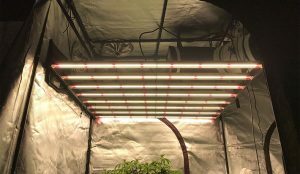 If you are using a fluorescent grow light, you can place it incredibly close to your seeds. This will prevent them from growing very long in spindly when reaching towards the light, which can result in them falling over. If you are using LED or HID grow lights, you will need to place these farther away, since they are much brighter. High intensity grow lights can burn delicate seedlings. Notice the moisture the humidity dome is creating. You can follow a basic veg lighting schedule, 18 hours of light followed by 6 hours of darkness. A simple light timer will automate this for you, so you don't have to turn them on and off yourself, and you can remain consistent. This is one of the three things important for germination, and many growers use a seedling heat mat to increase the temperature of their seeds to 75-80 degrees Fahrenheit. This range will encourage them to sprout much faster. 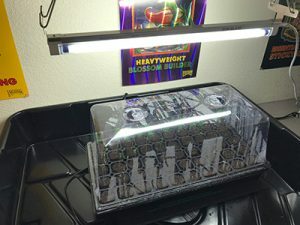 Using grow lights will also increase heat around your seeds. Since seeds don't quite have a root zone to seek out water yet, we need to make sure they can access moisture easily. This is why you need to presoak your growing medium or paper towel, and keep it moist the whole time. If you can cover your seedling tray with a humidity dome to increase the moisture for your seeds. You should shoot for humidity levels of up to 75%. For measuring and maintaining temperature and humidity, use a hygrometer. One of the biggest takeaways you should gather from this is that you will probably not have a 100% germination rate. Plan in accordance for this. If you want 5-10 plants, don't try and germinate 5-10 seeds. Germinate more than you need, and discard what you don't need in the end. A good start is crucial to a successful, heavy harvest. Put in the work now, and reap the benefits in a few months when you start pulling buds off your plant!